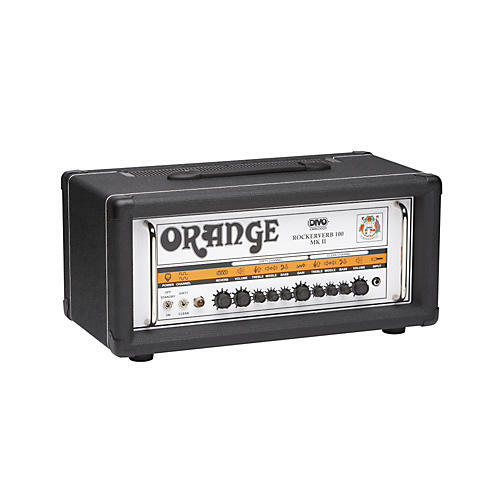 The Orange Rockerverb RK100H MKII 100W DIVO fitted tube guitar amp head is an all tube, channel-switching amplifier with an ultra-transparent effects loop and tube-driven reverb. This amplifier utilizes a two stage clean channel with a four stage dirty channel. The clean channel delivers a super rich clean tone with beautiful harmonic overtones. Much like vintage Orange amps, the clean channel is a non-master channel. When cranked the power section breaks up faster, delivering the most classic British crunch imaginable. The Dirty Channel is four stages of unadulterated filth, but it is no one-trick pony. Move the Gain knob from 0 to 10 for a variety of Orange tones, from metal to fusion, rock to blues, there's even some country in there.